The following are sources favored by the authors of this adaptation. 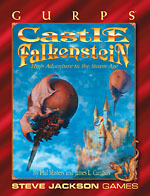 The original Castle Falkenstein game and its supplements have further bibliographies covering the sources used by its original authors. For other useful material, see the unofficial but excellent Castle Falkenstein Reading List on the Web. Barber, Noel. The Lords of the Golden Horn. Bidwell, Robin. Travellers in Arabia. Churchill, Winston S. A History of the English-Speaking Peoples, vol. IV. Freeth, Zahra, and Winstone, H.V.F. Travellers in Arabia. Girouard, Mark. The English Town; The Victorian Country House. Israel, Fred, ed. 1897 Sears, Roebuck Catalogue. Osprey Books' Men-at-Arms series has several volumes depicting military uniforms of the period. Tuchman, Barbara. The Proud Tower. Woodham-Smith, Cecil. The Reason Why. Blaylock, James. Homunculus and Lord Kelvin's Machine. Boothby, Guy. A Bid For Fortune and Dr. Nikola. Carriger, Gail. The "Parasol Protectorate" series is more supernatural intrigue than steampunk, but is positively steeped in Victorian high society's sense of propriety. Soulless, Changeless, Blameless, Heartless, and Timeless are great fun. The "Finishing School" YA prequel series (Etiquette & Espionage, Curtsies & Conspiracies, and Waistcoats & Weaponry) features the origin story of one of Alexia's allies, while the "Custard Protocol" sequel series, which starts with Prudence, follows her daughter's adventures. Chesterton, G.K. The Man Who Was Thursday. Davidson, Avram. The Adventures of Doctor Eszterhazy. Fraser, George MacDonald. The "Flashman" series. Frost, Mark. The List of Seven. Garrett, Randall. The "Lord Darcy" series. Gibson, William, and Sterling, Bruce. The Difference Engine (a prime source for the Steam Lords). Hope, Anthony. The Prisoner of Zenda; Rupert of Hentzau. Kipling, Rudyard. Virtually anything, especially earlier works (his main themes being colonial adventure, the supernatural, and science fiction). Moore, Alan, and O'Neill, Kevin. The League of Extraordinary Gentlemen (comics series). Priest, Christopher. The Space Machine. Twain, Mark. Most works, of course, especially including The Gilded Age. Wells, H.G. Wells started writing at the end of the century, but The Time Machine and The War of the Worlds are important. 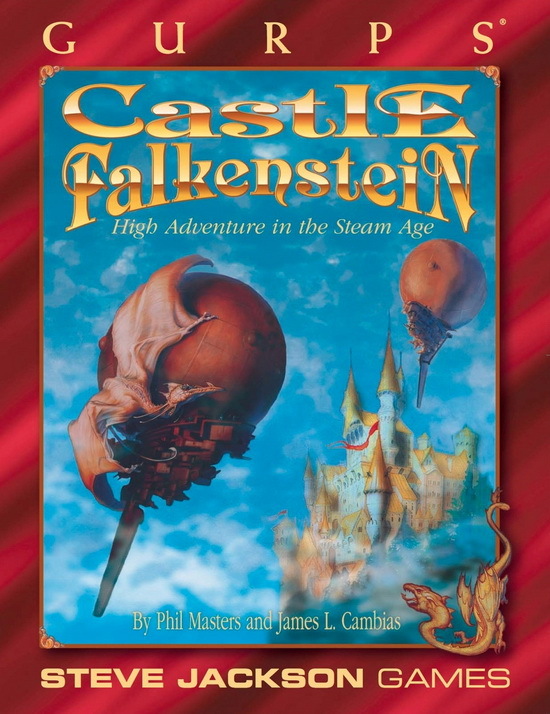 The original Castle Falkenstein line, published by R. Talsorian Games, Inc., comprised a core rulebook and half a dozen supplements (and two novels), all of which may still be available from game shops and booksellers. The extended background can of course be used in GURPS Castle Falkenstein games, and the game-mechanical information can be adapted (see the Appendix). The core rulebook details a good deal of the background, with a focus on New Europa, and includes much of Tom Olam's account of his arrival on the world, the restoration of King Ludwig to the throne, and the subsequent war with Prussia. Comme Il Faut ("A Castle Falkenstein Companion") includes extensive information on New Europan culture (especially high society) and campaign ideas, along with variant rules for the original game and suggestions for live-action play. Steam Age provides fully illustrated coverage of numerous vehicles and devices (some of them definitely Infernal). Six-Guns and Sorcery, a very detailed treatment of North America in the Falkenstein world, is an account of Tom Olam's first trip there, with additional notes. The Memoirs of Auberon of Faerie is a major treatment of New Europan Faeries, including the history of their activities in other universes; GURPS GMs will have to add game mechanics, but this should not be unduly difficult. The Lost Notebooks of Leonardo da Vinci deals with Engine Magick in detail, with descriptions of all the sorcerous engines currently thought to be possible. The novels From Prussia With Love and Masterminds of Falkenstein, both written by John DeChancie and published by Proteus/Prima Publishing, describe the further adventures of Tom Olam, including numerous encounters with other major figures of New Europa. Several other RPGs have dealt with 19th-century, fairy-tale, or steampunk themes; the following may be currently available and of particular interest. Call of Cthulhu, from Chaosium, is a classic horror game; although the original version is set in the 1920s, one major supplement, Cthulhu by Gaslight, and several follow-up works, focus on the later Victorian era. Forgotten Futures, a game of Victorian scientific romances, was originally released as a series of computer files, each accompanied by a collection of classic out-of-copyright stories. The core system has recently been published in book form by Heliograph Incorporated, who have also promised further volumes that include period literature and game ideas based thereon. Mage: The Ascension, from White Wolf (adapted as GURPS Mage: The Ascension, of course) is somewhat relevant; see especially the supplements Sons of Ether (for mad science), Order of Hermes (the ultimate western sorcerous society), and The Book of Worlds (science and magick fighting multi-sided battles across the dimensions and the solar system). Space: 1889, from GDW, was the original steampunk colonial RPG. It and its supplements are currently available in a reprint edition from Heliograph Incorporated. The "Doctor Who" stories Pyramids of Mars and the near-perfect The Talons of Weng-Chiang. The Prisoner of Zenda (any version, though the black-and-white Ronald Coleman version is often rated highest). Most Sherlock Holmes adaptations have some interest, though some are better than others; the 1980s British TV versions, starring Jeremy Brett, are very impressive. The Wild, Wild West (the TV series was a major inspiration for Falkenstein; the recent movie may be underrated). In addition, many older-style horror movies might be of interest. Virtually any period piece from Hammer is worth a look, as are some of the various versions of The Mummy (1934) or The Mummy (1942). The original Castle Falkenstein game has inspired plenty of unofficial fan Web sites; furthermore, there are countless sites dedicated to Victorian history and culture, steampunk fiction, and old technology. A number of suggested sites can be found at this book's product page. Just remember that the ephemeral nature of the Web guarantees this list will eventually change.